It was a thunderous special teams collision. 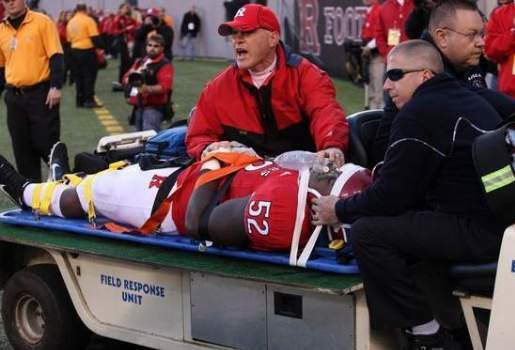 Rutgers Scarlet Knight Eric LeGrand, a 6’2, 275-pound defensive tackle collided head-on with Army Black Knight Malcolm Brown, a 5’11, 180-pound slotback. Both players were sent tumbling to the ground. Only one of them got up. Malcolm Brown was fine; Eric LeGrand was paralyzed from the neck down. “Eric’s spirits were as good as you could expect and he was cognizant of me being there and his mom and everybody,” said Rutgers coach Greg Schiano, who spent the night with LeGrand and his family. “I saw him before surgery and after surgery, and he’s a fighter.” He’ll have a lot of fighting to do, with a spinal cord injury like that. Especially scary is the fact that LeGrand has no movement below the neck.